Ever since the WWDC event in late March, which was widely panned by many of the company’s critics, Apple (AAPL) has been on an absolute tear. In the last ten trading days, the stock has risen 8.12%, and if it holds on to today’s gains it will be the first ten-day winning streak for the stock since October 2010! 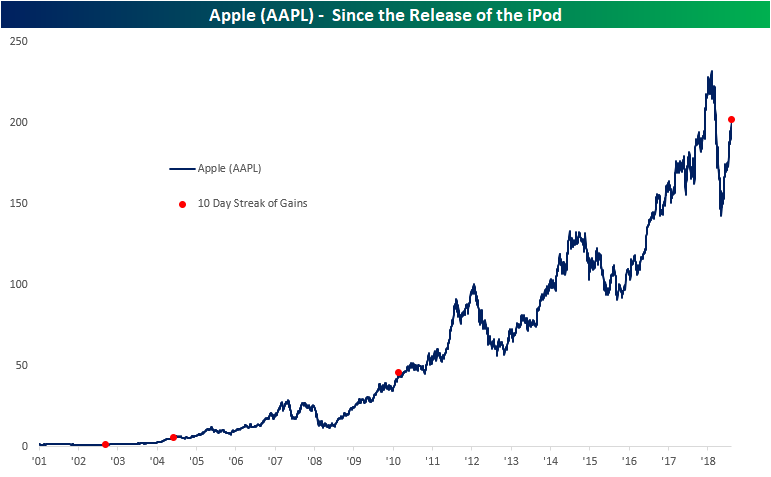 As shown in the chart below, since the launch of the iPod in 2001, this would only be the stock’s fourth streak of ten or more days of gains in a row. Start a two-week free trial to Bespoke Premium to access our individual stock research and much more. Additionally, if Apple’s winning streak keeps up in tomorrow’s trading, it will be the stock’s second-longest such streak ever. The only one longer was back in 2003 when it had a 12-day winning streak. Regardless of what happens tomorrow, looking further out the stock typically hits some rough waters over the short term before righting the ship. Following similar streaks, AAPL saw declines in the following week and month on both an average and median basis. Three months out things improve a bit, and six months to one year out, returns have been positive across the board with considerable gains. All in all, with the stock also now extremely overbought (>2 standard deviations from the 50-DMA), some type of short-term mean reversion is increasingly likely.